Remember when skinny jeans re-emerged a few years back? Largely out of vogue since their heyday of the '80s era, when punk and metal scenesters adopted the calf-hugging denims as a reaction to the elephant-bell-bottom jeans of the 1970s, their home-crafted origins often resulted in what appeared to be a pair of rather sloppily tailored denim jodhpurs, comically undermining their objective as fashion statement. Twenty-first-century skinny jeans, on the other hand, are the product of mass-market demand. Offering stylish and comparatively conservative tailoring right off the rack, these duds offer buyers a painless way to get in on the latest trend while bolstering profits for their makers. 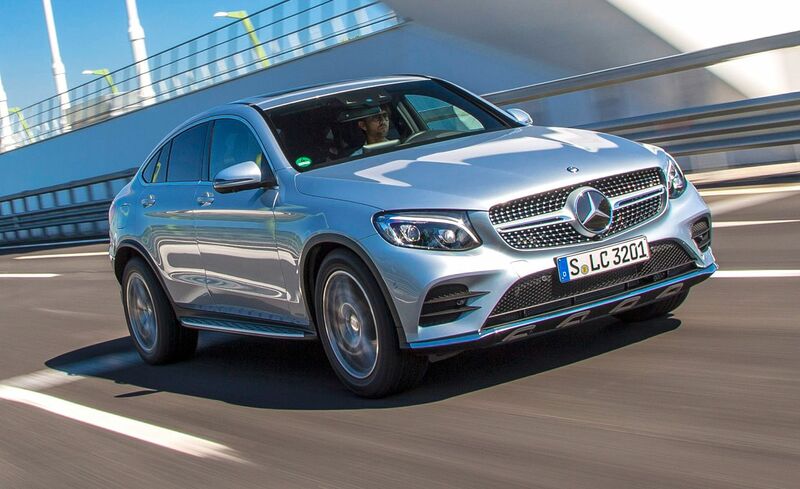 The 2017 Mercedes-Benz GLC coupe is largely a product of the same philosophy. Based on the popular GLC compact luxury crossover, the GLC coupe dials up the style and hipness factors directly from the factory, while attempting to adhere to its core utility mission of hauling people and their stuff. Rival BMW tested these waters with its larger X6 so-called four-door coupe back in 2008, and fashionable consumers dutifully fell in line with cash in hand; when the compact BMW X4 four-door coupe resonated similarly in 2014, it signaled that a genuine shift in consumer taste was at hand. Even better, from the manufacturer's standpoint, is that most of the heavy development work for the coupe was already done; they could simply derive a second model from an existing architecture. No longer a quirky anomaly, the GLC coupe is just the latest model to get in on the four-door crossover-coupe action. As often is the case with pants, the point of the GLC coupe is a stylish cut. Whereas the tall roofline of the GLC was designed to provide maximum headroom and cargo space, the GLC coupe cuts a more rakish profile that says to the world, “Hey, I'm a practical guy, but I haven't entirely given up.” At 63.0 inches high and 186.2 inches long, it's 1.6 inches lower and 3.1 inches longer than the regular GLC-class. Most of the extra length comes from the designers' need to extend the gently sloping roofline into the rear haunches while maintaining proportions that avoid comparison with the Pontiac Aztek. It works here, looking better integrated than some of these styling exercises. The rear features a beefed-up bumper incorporating a pair of chrome exhaust tips (standard) that exit through a diffuser-like lower panel. Split taillamps and a sharp spoiler lip supposedly echo those of the S-class coupe; squint and you can see the resemblance, but the GLC version definitely resides in an entirely different tax bracket. The front lighting elements also toe the corporate styling line, while the A-pillars are slightly more upright than those on the standard GLC. Skinny-jean stylishness can result in an uncomfortably tight fit; similarly, the CUV coupe form is known to pare rear-seat headroom and cargo space. Unfortunately, we can't tell you exactly how much rear headroom has been lost, since official interior dimensions have not yet been released and we neglected to pack laser-enabled yardsticks for this first drive of the GLC coupe in the mountains of Italy. It doesn't seem excessively cramped, though. (We'll have hard numbers as soon as we get one for a full test.) Preliminary European info pegs the cargo capacity at 18 cubic feet with rear seat up, which is only slightly less than the 19 cubes in the 2016 GLC 300. That's a small price to pay for looking good. Interior appointments nearly duplicate those in the GLC. That means supportive seating and a large center console that stretches from the armrest to the dashboard, intersecting just behind the surface of the infotainment display (a 7.0-inch unit is standard; an 8.4-incher is optional), which stands proud atop the dash, above the circular HVAC vents. Standard equipment, as on the regular GLC300, includes power-operated sunroof, driver's seat, tailgate and folding mirrors; collision prevention assist; and keyless start, among other minor niceties. The same 241-hp turbocharged four-cylinder engine that propels the GLC provides motivation for the GLC300 coupe. A nine-speed automatic transmission—with shift paddles, natch—shuffles 273 lb-ft of torque to all four wheels via a standard 4MATIC all-wheel-drive system. (At this point, a two-wheel-drive GLC coupe is not in the cards for the States, although that configuration appears on the regular model, which we can't make ourselves call the “sedan” version.) Mercedes claims the Euro model completes the dash to 62 mph in 6.5 seconds; we hustled a standard GLC300 4MATIC to 60 mph in 5.9 seconds and have every reason to expect the coupe version will match that pace. We drove a GLC300 coupe equipped with the standard Dynamic Select system (MB's Air Body Control air suspension is optional) that lets the operator ratchet through five settings (eco, comfort, sport, sport+, and individual). As for tuning of the individual parameters, Mercedes engineers went all Nigel Tufnel on us and said to think of each setting as “one more sporty” than the same settings in the standard GLC300 crossover. We couldn't resist the urge to ask, “why not just make eco, comfort, and sport the same and then make sport+ the most aggressive setting in a GLC to date?” Apparently 1980s film references don't translate into German as easily as we had hoped. No interpreter was needed to pick up on the firmer baseline, however; the coupe feels more buttoned down, to the extent that a few patches of rough pavement even forced the suspension uncomfortably into the bump stops. We found the sport+ setting to be our friend when winding through narrow mountain roads above the Aosta Valley region in northern Italy. Rarely did we need to tug a shift paddle, since the Sport+ setting aggressively holds on to gears. The coupe hung tight in the bends, demonstrating mild and predictable understeer; the sport+ setting allowed the occasional wiggle to be coaxed from the rear end when the situation allowed some play. Braking performance is competent, and we experienced no fade or pedal softness even after long downhill stretches punctuated by dozens of tight hairpins. The slightly more raucous exhaust note of sport+ only served to encourage aggressive driving. That said, we rarely found room to exceed 120 mph, where the GLC300 coupe displayed the same quiet, solid interior traits of the standard model. Forced-induction engines suffer less performance loss from the thin air at altitude than do naturally aspirated ones, and we found that to be true with the GLC coupe. That said, one local in a decades-old Fiat Panda who saw our presence as a challenge managed to elude us for nearly 20 miles, seeming to defy physics while spewing a cloud of black smoke from the tailpipe for the duration, which was reason enough to try to get by him. Much of the chase was peppered by oncoming traffic with little to no regard for the tiny goat path of a road and the precipitous cliffs; while the origin of the Fiat driver's trousers remains a mystery, we're confident the cut offered plenty of room in the crotch. Thank heaven for the GLC300 coupe's relatively small footprint and easy-to-wield nature, even if the roofline reduces rear visibility. If you hold to the notion that the crossover segment's appeal is grounded in all-around practicality and utility, these coupe variants make no more sense than a pair of blue jeans you can't wear to work at a construction site. Yet, as with virtually every other consumer product of the past century, designers and marketers eventually work to widen the appeal of the single, core product. And the GLC coupe is just that—a more stylized expression of the crossover. Why bother with the hassle of shrinking to fit when you can buy a more stylish cut off the rack? Look for the GLC coupe to hit showrooms in early 2017, just in time for fashion week. We have a 2017 GLC, 250d, here in Australia. Love the SUV, excellent. Just ordered a GLC Coupe, expect delivery in Dec 16, if we are lucky, but hopefully by end January 2017. Never thought we would have two MB in the driveway !